Your warehouse is, like it or not, an inherently dangerous place. Heavy, bulky items, sensitive equipment, and fragile materials fill it from floor to ceiling, and so you have to make sure that everyone follows the proper safety procedures when working in a warehouse. One piece of equipment in particular should only be operated with the utmost care: the pallet jack. Wondering what the best pallet jack safety procedures are? Read on to find out! –Place a foot under the pallet jack. Some people might try to straighten out a pallet jack by pushing it with their foot or hooking their foot underneath it. But this can be hazardous, especially when using an electric pallet jack that you could lose control over, and so it is best to avoid altogether. –Place an overweight load on a pallet jack. Your jack will have a specific weight capacity, and it is important that you adhere to it. Overweight loads can do serious damage to your pallet jack otherwise! –Speed while operating a pallet jack. Move at a slow and steady pace throughout your facility- you never know when some unexpected obstacle might come into your path. –Pull the pallet jack. 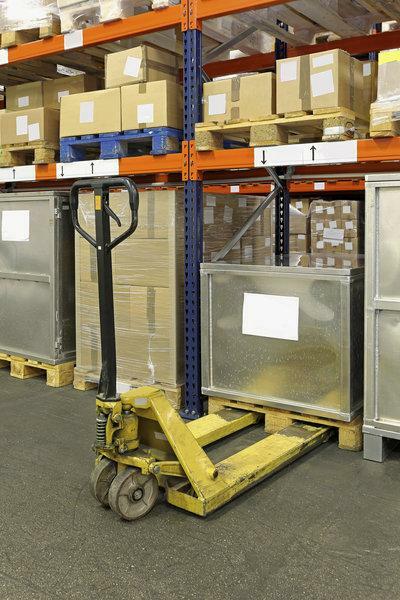 Standard operating procedures say that you should always push, not pull, a pallet jack. This both reduces strain and allows you better control over your movements. After purchasing your new pallet jacks from S.W. Betz, familiarize yourself and your team with these procedures to ensure a safe and healthy workplace! This entry was posted on Tuesday, January 20th, 2015 at 9:28 pm. Both comments and pings are currently closed.